A cutting tool is only as good as its blade, which is why professionals and savvy DIY’ers recognize the importance of regular sharpening. The act of shaping wood or stone into a cutting tool is as old as mankind, but today’s sharpening systems make the job easier and more efficient than ever before. Here’s a look at the latest devices to give your tools that razor edge. 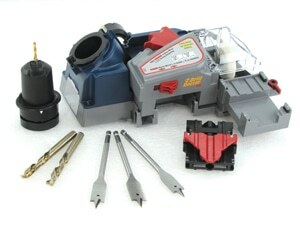 One of the leaders in electric tool-sharpening systems for the home is the Darex Company, which manufactures both the Work Sharp and Drill Doctor line of products. 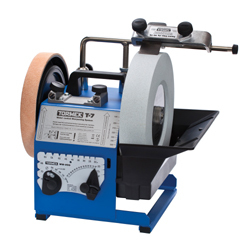 For the woodworker, the Work Sharp WS3000 Wood Tool Sharpener is an air-cooled dry sharpening system for a wide range of cutting tools, from chisels, planes and carving tools to lathe tools and spoke shaves. Sharpen more quickly, easily and cleanly than ever. Powered by a 1/5-horsepower motor with high-torque max wheel speed of 580 RPM, the WS3000 uses a tempered glass grinding wheel that can be fitted with a variety of abrasive grits on both the top and underside of the wheel. Wide tools like plane blades can be sharpened on the top side of the wheel using the adjustable tool rest. 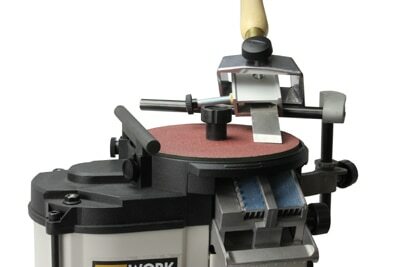 Narrow tools, such as chisels, can be sharpened from the underside of the wheel, using the adjustable sharpening port. This port sharpens angles of 20, 25, 30 and 35 degrees to match the bevel of chisels and plane irons up to 2-in. wide. The port also features an abrasive surface that removes burrs from the tool during sharpening. The system’s routed airflow and heat sink keeps tools cool without the mess of water. A new Tool Bar Attachment for the WS3000 provides a faster, more consistent and repeatable way to sharpen lathe turning tools, even on very complex grind types. The Tool Bar Attachment also provides improved freehand sharpening to all sides of the grinding wheel. For the woodworker, the WS3000 is an air-cooled dry sharpening system designed for a wide range of wood tools, from chisels, planes and carving tools to lathe tools and spoke shaves. The Swedish-built Tormek T-7 is one of the most versatile wet grinder systems on the market. For professional-grade wet sharpening, the Swedish-built Tormek T-7 is one of the most versatile wet grinder systems on the market. Appreciated worldwide for its versatility, accuracy and ease of use, the T-7 can sharpen all kinds of tools to a perfect edge—knives, scissors, axes and more—and sharpens all qualities of steel including high-speed steel. The maintenance-free, industrial quality motor with ball bearings maintains a constant speed even under full load. The T-7 features a stainless steel main shaft and a sturdy steel frame with powder-coat finish for maximum protection. It includes an extra wide water trough, a magnet for collecting steel particles, and a removable water chute for long tools. The T-7 requires no tools to change wheels and has a micro-adjustable support bar for accuracy. The 10-by-2-in. wide 220-grit aluminum oxide wheel runs at only 90 RPM through a water bath. 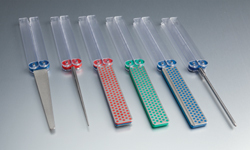 This means a razor sharp edge with no chance of overheating or over grinding precision instruments. Any burr left on the tool is easily removed by using the flat leather honing wheel. An electric knife sharpener, the WSKTS uses a flexible belt-sharpening technology that conforms to any shape of blade to renew any type knife. Whether you’re carving wood in the workshop or slicing onions in the kitchen, a sharp knife is the key to success. 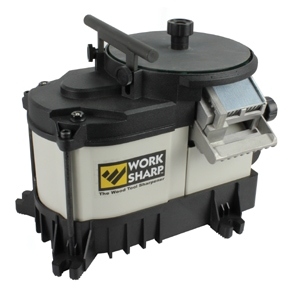 For a powered solution, the Work Sharp Knife & Tool Sharpener (WSKTS) uses a flexible belt-sharpening technology that conforms to any shape of blade to hone any knife fast and with repeatable results. 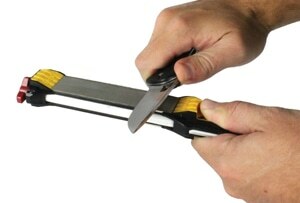 Easily sharpen hunting knives, kitchen knives, pocket knives, serrated blades and other blades to a shaving sharp edge. Powered by an electric motor, the WSKTS operates with easily replaceable abrasive grit belts and won’t burn or damage blade steel. The Work Sharp Guided Field Sharpener 2.2.1 is the first angle-guided, 5-stage sharpener designed for a complete, compact field solution. For tool sharpening “on the fly”, the Work Sharp Guided Field Sharpener 2.2.1. is a complete knife sharpener for field, home or shop use. This manual tool is the first angle-guided, 5-stage sharpener designed for a complete, compact field solution. The WSGFS221 features two diamond plates, two ceramic rods, one leather strop and sharpening guides to provide fast, easy and consistent sharpening. The 20- and 25-deg. sharpening guides create consistent blade-edge angles for your hunting knives, pocket knives and filet knives. Strong rare earth magnets secure the easily interchangeable diamond plates and also provide coverage for the broadhead wrench and small storage compartment. For an easy-to-use and bud-get-friendly knife sharpener, the AccuSharp Knife and Tool Sharpener is a handy gadget that anyone can use. The honing blades are diamond-honed tungsten carbide for years of reliable knife sharpening. 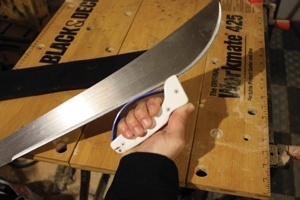 Just draw the AccuSharp over the blade and in about 10 seconds you can sharpen cleavers, axes, machetes and even serrated knives. The full length finger guard protects your fingers, and the safety hand grip prevents cuts. Available for less than 10 bucks, the AccuSharp Knife Sharpeners will not rust and can be cleaned in the dishwasher. The AccuSharp Knife and Tool Sharpener is a handy, budget-friendly gadget that anyone can use. The Diafold Folding Sharpeners from DMT are easy to use, compact sharpeners for the toolbox, tackle box, home or on–the-go. 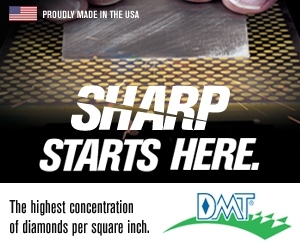 These devices use a micronized diamond-grit abrasive that covers evenly across the sharpening surface to remain effective year after year. The lightweight folding models are available in a wide range of diamond grits to solve an assortment of sharpening, abrading and honing challenges. They can handle any edge, straight, curved or serrated. Choose from double- or single-sided sharpeners. The Diafold Serrated Sharpener has a conical file blade to handle serrated edges, and the Diafold Flat File is an excellent sharpener for narrow spaces such as pruners and loppers. Each model in the Diafold line features new see-through handles manufactured from tough engineered resin, and for the green-minded consumer the new packaging is smaller, lighter and uses 93 percent less plastic. Drill Doctor has been an Extreme How-To workshop staple for years. The best bit sharpener on the market, Drill Doctor is available in five models to keep your bits razor sharp and ready for action. The machines are simple to align for sharpening drill bits ranging from 3/32 to 3/4 inch. (depending on model). Available in five models, a Drill Doctor keeps your bits razor sharp and ready for action. The machines are simple to align for sharpening 3/32” to ¾” drill bits (depending on model). With just a few easy turns of the dual cam sharpener in the Drill Doctor 750X, you can restore the cutting edge of your bits in minutes. The 750X shop model has the flexibility required to sharpen the largest range of dull or broken bits, including split points and masonry bits. It sharpens variable point angles from 118 to 135 deg., or you can customize an angle from 115 to 140. The baseline Drill Doctor Model 350X simplifies the process for hobbyists and DIY’ers with on-chuck alignment which eliminates the alignment port for even easier sharpening. Using a replaceable diamond wheel, the 350X sharpens 3/32- to 1/2-in. bits to a 118-deg. point angle. The spade bit module of the Drill Doctor DDSB uses an industrial-grade profiled wheel to sharpen spade bits from ¼” to 1-1/2” including specialty spade bits with screw points and spurs. 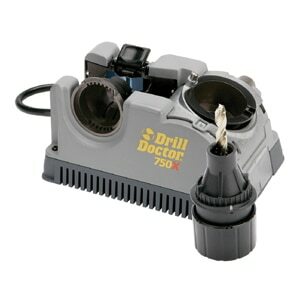 Drill Doctor Model DDSB is a precision machine that sharpens both twist and spade bits. The spade bit module uses an industrial-grade profiled, vitrified wheel to sharpen spade bits from 1/4 to 1-1/2 in., including specialty spade bits with screw points and spurs. The portable Timberline Chainsaw Sharpener gives the ability to sharpen your chain on the job, preventing work stoppages spent searching for a repair shop. Billed as “the ultimate chainsaw sharpener”, the Timberline Chainsaw Sharpener gives the ability to sharpen your chain on the go. This portable device prevents work stoppages spent searching for a repair shop. The traditional method of using round files to sharpen chain blades can take a lot of time and practice. The Timberline Sharpener guarantees accurate and precise angles on every tooth as a solid platform guides the carbide cutter into each tooth. 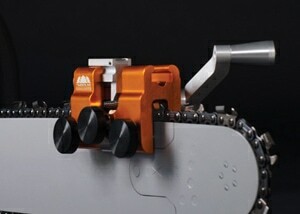 A sharp chainsaw is safer and more productive, self-feeding into the wood to cut through a log in seconds. A dull chain tends to bounce off the wood, take longer to cut, and can pose a danger if the operator pushes down on the saw trying to force the cut. Sharpened with a Timberline, a chain is much more predict-able and cuts more efficiently.